I think the underground search was done back in 2010. The footage came out in last year, if I'm correct. 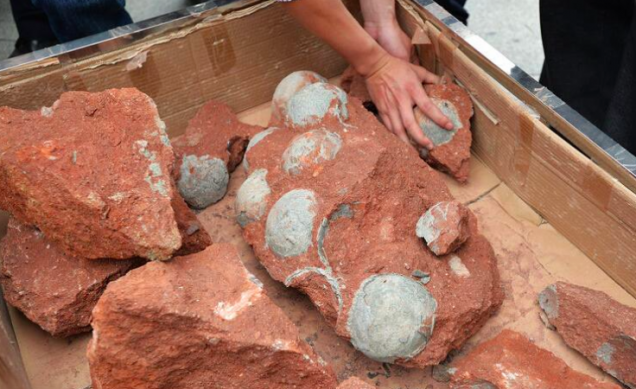 "A giant clutch of 43 fossilised dinosaur eggs were discovered by workmen doing roadworks in China. More pictures at link. Wonder if the red clay they're in is Terra Cotta. Tx phillipbbg for the link in shout, fascinating! History is replete with stories of lost magical cities. Stories such as the lost city of Z, which claimed the life of legendary explorer Percy Fawcett and his son. Or the lost city of Hy-Brazil, a technology advanced Phantom Island which was known by early mariners to occasionally appear in the Atlantic. The crystalline towers of its main city jutting up off the horizon. Let us not forget Atlantis, Lemuria and even Hyperboriea. All mythical islands lost to time or natural disaster. Even Shamballa and Agartha, which were lost in the snows of the Himalayas. There are still other lessor known, but equally as fascinating lost cities which appear to stand the test of time. The commonality? They all seem to have some sort of amazing high technology and also appear to be phantoms. It is one of those fabled cities which we will now explore. A city of true amazement, a technological wonderland, and a city without a name which apparently has remained hidden for almost a century. For more then 30 years there has been a persistent rumor. A rumor, which has not been widely reported but is fascinating nonetheless this nameless city buried deep within the Andes Mountains and was founded by none other then Guglielmo Marconi and his protégé’s. Powered by Tesla technology and hidden from the world. The story as it now exists was originally discussed in a book called “The Mysteries of the Andes” by Robert Charroux and published in 1974. It was later translated from French and published by Avon books in 1977. Charroux, a world class Fortean adventurer, had gone to South America in search of a hidden codex called the ICA Codex which purported to show a lost human civilization millions of years old, as well as lost underground tunnels and cities. The story was then picked up by Renato Vasco and published in his book “Man Made UFOs” and from there it has simmered. Marconi, the son of a wealthy Italian family had started working on radio technology with Tesla and pioneered radio communication. In 1896 he broadcast a transmission nine miles across the Bristol channel and by 1899 was sending transmissions across the English channel some 30 miles from his transmitter. In 1901, after improving his transmission equipment, he broadcast a transmission from Cornwall England to St. John’s in Newfoundland Canada. In 1909 Marconi, along with Karl Braun, was awarded the Nobel Prize for Physics. By the 1930’s Marconi, and his student Landini, were working on Antigravity. In fact Marconi, who by this time was a millionaire many times over, converted his Yacht the “Electra” into a floating super lab where they successfully sent signals through the earth, much in the way Tesla did. In June of 1936 Marconi made another leap forward and demonstrated a energy wave canon for Benito Mussolini on a busy autostrata outside Milan. Apparently, according to the story at least, Mussolini had asked his wife Rachele but be at the motorway at precisely 3:30pm. Marconi triggered the device and for over 30 minutes every car suffered a complete electrical failure. At precisely 3:35pm Marconi switched the device off and the car, including his wife’s, started up. Mussolini was said to have been quite pleased with the result and began to move towards the notion of weaponizing it. This displeased Pope Pius XI who is said to have taken an interest in the device and was able to prevent further research. Fearing repercussions from the Vatican, Marconi then faked his own death then sailed his yacht to South America sometime in 1937. It is believed that Marconi took some of the brightest minds in Italian research when he left including Fulcanlli and Landini. The total count was about 98 total scientists who disappeared with Marconi. Their ultimate destination was said to have been in the southern jungles of Venezuela where they setup a technological utopia complete with free-energy motors, Tesla technology and even a new kind of aircraft, which used a form of anti-gravity Marconi and Landini were said to have perfected. It was in that secret city the scientists are said to have perfected many of the free-energy and Tesla technologies which we read about today. They are also said to have dedicated themselves to the peaceful application of these technologies and remained isolated from the rest of society even to this day. Working in the shadows to provide new and updated ecologically friendly technology. The story first came to light in the book “The Mysteries of the Andes” by Robert Charroux. In the book he discussed having heard the story of the Cuidad Subterranea de los Andes from a Mexican Journalist named Mario Rojas Avendaro who had heard about the city “from Caracas to Santiago” which eventually prompted Avendaro to investigate the story futher. Avendaro claimed that most of the detailed information of the secret city had come from a man named Naisso Genovese who had contacted him about his research into the city. Genvoese had been a student of Marconi and had spent time with him in the city. At the time he contacted Avendaro, Genovese was working at a physics teacher at a school in Baja California. Genovese claimed to have spent a number of years working in the city and even published an account of a alleged trip to Mars using a Tesla / Marconi powered flying saucer. In the 1950’s he wrote about the trip in a very rare, and frankly odd, book entitled “My Trip to Mars.” A book which, although it was never published in English did come out in numerous other languages. In discussing the city with Avendaro, Genovese claimed that it had been built with Marconi’s fortune. Marconi, before his death, had shifted large amounts of his fortune into secret accounts which he accessed to acquire the materials he needed. Genovese also claimed that by 1946 the scientists had built a massive cosmic energy collector based on Marconi’s improvement of Tesla’s original designs. He also went into some detail about the massive and amazing research facilities they had constructed saying it was probably the greatest laboratory ever built on the planet. By 1952 Genovese claimed they had constructed a new type of aircraft with an almost limitless supply of energy, and scientists had used it to explore almost the entire globe including the oceans. The craft was said to be able to accelerate to 500,000 miles per hour and was built out of a new alloy which could withstand enormous the enormous pressures of the deep ocean as well as traveling through the atmosphere at extremely high rates of speed. The only problem he said the device had was acceleration. It was something the scientists were still working on. The implication was that the device was also capable of stellar, possibly interstellar, travel and it had also been used to visit various planets in the solar system. We know from Genovese that he claimed regular trips were being made to the Moon and Mars. The implication being that a outpost could have possibly been setup at one or both of those locations. Avendaro then pressed Genovese for the location of the secret city. Genovese responded by saying that it was located at the bottom of a crater, was mostly underground and was at almost 13,000 feet above sea level. It is believed that the city is located in an extinct volcano in the eastern Andean Cordillera somewhere in the Bolivian or Venezuelan mountains. That seems to be where the story ended, and no further investigation has been made. Some researchers have hypothesized that Tesla, having been contacted by Marconi, faked his death and also traveled to the magical city. But is a hidden high tech city really feasible? Given the region where the city is supposedly hidden and the sheer size and vastness of the unexplored land in that region it is completely plausible such a city could indeed exist. Especially if that scientists there had perfected free-energy and anti-gravity. With those two technological leaps there is really no limit to what they could have achieved. Is this Cuidad Subterranea de los Andes, or Underground City of the Andes, real? We will probably never know for sure but it does remain one of the more mysterious and enigmatic hidden cities of legend. If it is real, there was certainly the brain power required to make such stunning technological advancements but for now it will have to remain a lost city. Olav Phillips is Conspiracy Researcher, specializing in the Secret Space Program, Exotic Aircraft, High Technology, Foreign Policy, Pre-History and Mysterious Civilizations. He is a regular contributor and publisher of Steamshovel Press and Mysterious Magazine. He has also written for Paranoia, FATE, Mysteries Magazine and served as Executive Producer and Principle Researcher for Ground Zero Radio with Clyde Lewis (Nationally Syndicated by Premiere Radio Networks). Olav has also appeared on many popular radio shows as well as television presentations including: America Unearthed, UFO Hunters, The Outer Edge, The Higher Side Chats, ConspiracyHQ TV, Shadows In the Dark Radio, Coast to Coast AM, Voyager (RAI Due), as well as being a long time contributor to Ground Zero Radio’s investigations including the famous Tracy, CA UFO Crash case featured on UFO Hunters. Olav has also contributed to many of the television presentations you’ve seen on Area 51, UFO’s and conspiracies. Olav is the owner of The Anomalies Channel, a online video channel with over 35,000 subscribers and hundreds of videos available to ROKU players all over the world as well as The Anomalies Network which is the primary source for his writings and research. "THE discovery of an ancient piece of aluminium is being hailed as evidence that aliens visited Earth 250,000 years ago. 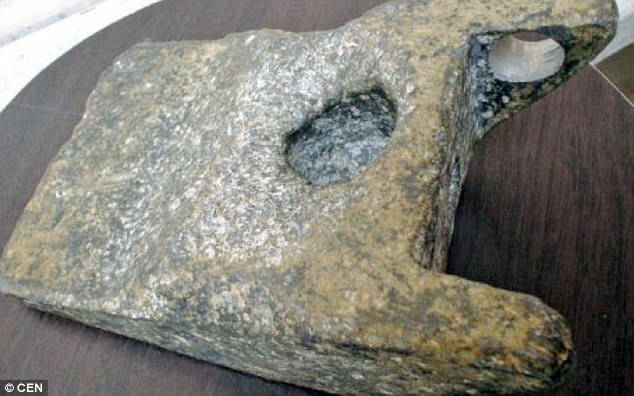 The mysterious hunk of metal was found in Romania during the 1970s, when thecountry was under communist rule." 250,000-year-old artifact: The ultimate evidence of ‘Ancient Astronaut’ technology? "More precisely, Wittenberger claims the alleged ‘alien artifact’ was actually part of the landing gear of a Messerschnmitt ME 262. But there’s one problem with that explanation. The mystery object is 250,000 years old. The mysteries surrounding the artifact have not been solved, and currently, the ‘out-of-place- artifact resides in the History Museum of Cluj-Napoca, next to a sign that reads: ‘origin still unknown’." "In 2005, David Elliott was guiding his mob of sheep through central Queensland, Australia, when two fossilized bone fragments poking out of the soil caught his eye. As the eye in question was connected to the brain of a man who co-founded the Australian Age of Dinosaurs Museum, it was an organ better trained than most to spot ancient animal remains. Elliott returned to the spot with his wife, Judy, excited to show off what he believed were separate segments of a meat-eating dinosaur’s limb. But Judy Elliott noticed something that her husband did not. She realized the bones fit snugly together, revealing not a limb but a single large toe. It turned out they had found a heretofore undiscovered species of Australian dinosaur — an immense, four-legged creature that, at 40 to 50 feet long, was roughly the length of an 18-wheeler trailer. The Elliotts nicknamed the dino Wade, in memory of a close friend and fellow paleontologist. 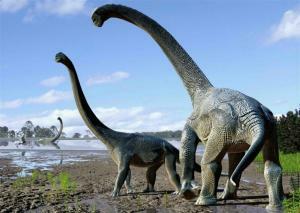 With the help of the Queensland Museum, the Elliotts, who are both paleontologists, extracted Wade’s remains from the ground. This was not a simple task. The bones were locked in a large concretion of rock, which the excavators broke open by taking jackhammers to its preexisting cracks. All told, they removed 17 pallets of rock from the site, located at Australia’s Winton Formation, which dated to the beginning of the Late Cretaceous. The samples amounted to what paleontologist Stephen F. Poropat described to The Washington Post as “literally tons of material." OK just so you know, I realize it says 2005, but seems the info was just released. Neolithic Dragon poeple, `reptilian humanoids! Amazing, unity. Also amazing that we generally don't know about those megaliths. Looks like the same folks who brought us Stonehenge, Göbekli Tepe, Sacsayhuaman, etc. 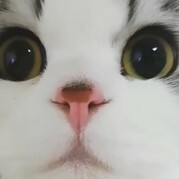 Yeah, Kandy(・ω・)ノ, I believe there are lots and lots sites that we've never heard of in the places we had never focused on before...the world is filled with wonders and my heart sings with the anticipation.....( ✧ω✧) So exciting that they are all waiting for us to re-discover them again! JFYI, this info could have come from Sorcia Faaaaliolio site. Just be ware, please. I'll cross post this to the Giant thread later. "A painstaking investigation of Europe’s cave art has revealed 32 shapes and lines that crop up again and again and could be the world’s oldest code"
"When she first saw the necklace, Genevieve von Petzinger feared the trip halfway around the globe to the French village of Les Eyzies-de-Tayac had been in vain. The dozens of ancient deer teeth laid out before her, each one pierced like a bead, looked roughly the same. It was only when she flipped one over that the hairs on the back of her neck stood up. On the reverse were three etched symbols: a line, an X and another line. The first formal writing system that we know of is the 5000-year-old cuneiform script of the ancient city of Uruk in what is now Iraq. But it and other systems like it – such as Egyptian hieroglyphs – are complex and didn’t emerge from a vacuum. There must have been an earlier time when people first started playing with simple abstract signs. 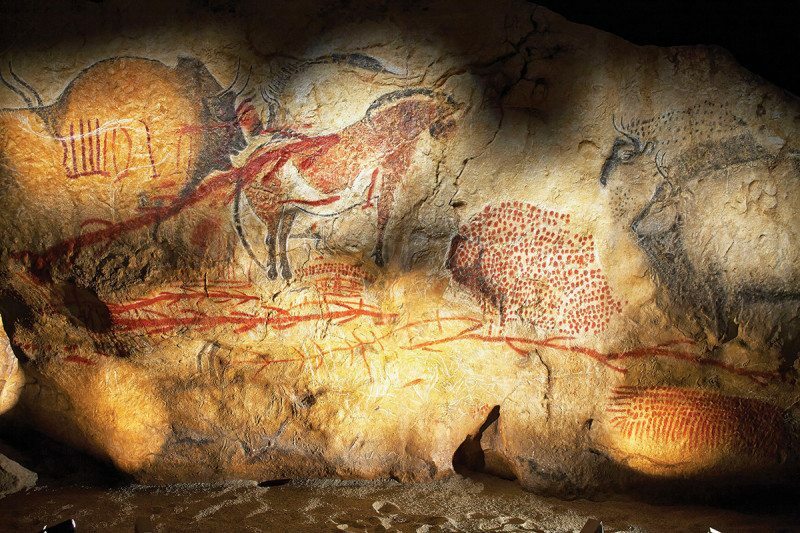 For years, von Petzinger has wondered if the circles, triangles and squiggles that humans began leaving on cave walls 40,000 years ago represent that special time in our history – the creation of the first human code." If so, ... sorry, it's a pay to read, but it gives you beautiful rock art to look at and perhaps at least an idea of what they are talking about. Archaeological remains in two capitals of a long-lost empire are destroyed as battle to liberate Mosul continues. Recently released satellite imagery of archaeological sites around the northern Iraqi city of Mosul has revealed extensive destruction at two capital cities of ancient Mesopotamia, according to researchers with the American Schools of Oriental Research Cultural Heritage Initiatives (ASOR CHI). The ziggurat of Nimrud, a towering sacred structure built nearly 2,900 years ago, was leveled between the end of August and the beginning of October, most likely by the Islamic State. Kurdish Peshmerga forces severely damaged archaeological remains at the site of Dur-Sharrukin while digging defensive berms and trenches at the site between mid-October and early November. Mesopotamia's "Most Spectacular Sacred Structure"
It became the capital of the Neo-Assyrian empire in the ninth century B.C under the reign of Ashurnasipal II. In 879 B.C., the ruler built a sacred precinct dedicated to Nimrud's patron deity, the war god Ninurta. The precinct included a large temple and an enormous mudbrick ziggurat, or stepped tower, that measured nearly 200 feet by 200 feet at its base and likely measured 200 feet in height. When archaeologist Austen Henry Layard excavated the ziggurat some 2,700 years later, the ruins still stood 140 feet high. It was considered "the most spectacular sacred structure known from ancient Mesopotamia." While no one has claimed responsibility for the destruction, it is likely the work of the Islamic State, says Michael Danti, ASOR CHI's academic director. In the spring of 2015, the terrorist group destroyed the Northwest Palace of Ashurnasipal II and the Nabu Temple at Nimrud. Please check out the latest Mummified body discovered in Peru. Brian Forester has been on it. 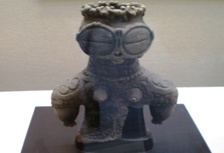 Some of ancient, bits and pieces of Japanese Jomon earthenware were excavated on Peruvian land. The scientific research had found that those artifacts really came from Japan via soil matching. 1500 years ago's girl's body who was a human sacrifice in Peru got the DNA came from Japan in it. 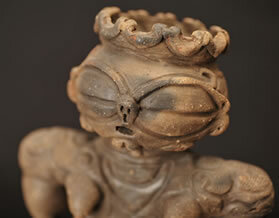 ...And that style of eyes... Below examples are all from Jomon period, from different sites. WHY Japanese Imperial House specially visited Peru? That happened back in 1958 and 1967, then Emperor himself visited to Brazil and Argentina 3 times. Oh, and JOMON period's existence in Japan stretches back to 120,000 years ago. NOT 12,000. "A ceramic vessel bearing the sculpture of a pensive-looking figure has been found in the Israeli city of Yehud. "The level of precision and attention to detail in creating this almost 4,000-year-old sculpture is extremely impressive," Itach said. 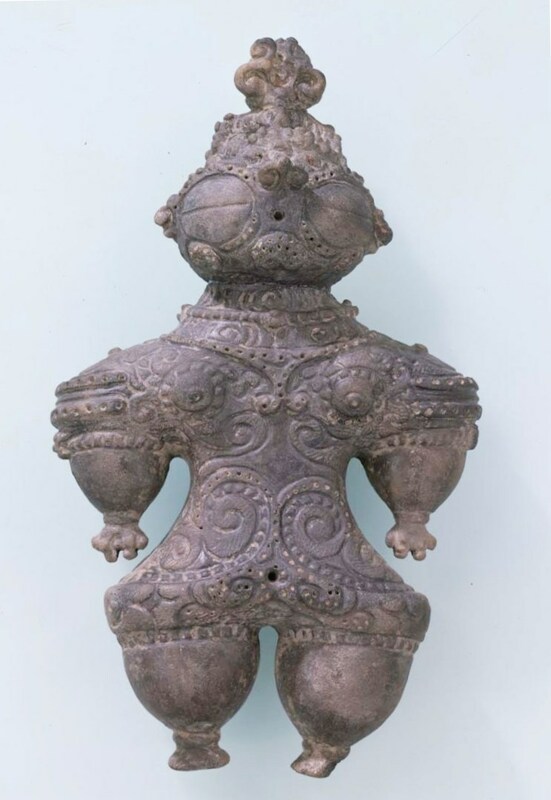 "To the best of my knowledge, such a rich funerary assemblage that also includes such a unique pottery vessel has never before been discovered in the country," Zilber said. Deeper excavations revealed artifacts dating back at least 6,000 years. These included pottery vessels, flint and basalt tools, and animal bones, according to the IAA. Researchers also found a Copper Age butter churn." "While we were stuffing our faces with mashed potatoes this past Thursday, we missed the announcement of a major scientific discovery—a sacred capital city of ancient Egypt that had been lost for 7,000 years. This city was found just 400 meters (0.25 miles) from the Temple of Seti I in the sacred city of Abyd. Experts are already coming out to comment on the find, saying it’s so important because it appears to be the beginning of Egyptian history." "An international team of experts has discovered a mysterious ‘lost city’ in central Greece that could offer new clues to the region’s history. Experts have already made significant progress in the archaeological project. “We found a town square and a street grid that indicate that we are dealing with quite a large city,” said Rönnlund, in the press release. The area inside the city wall measures over 99 acres, or 75 football fields." "Ground-penetrating radar located remnants of a town square and a street grid on and around a hill in central Greece." "A stone slab found off the coast of Israel has finally revealed the name of the ruler during one of the most iconic moments in Jewish history: the Bar Kokhba revolt. The inscription was clearly visible, even beneath the water, the researchers said. The team eventually decided to bring the slab out of the water, to prevent damage to the inscription. Researchers discovered that the massive, 1,300-lb. (600 kilograms) slab had seven lines of ancient Greek inscribed upon it."